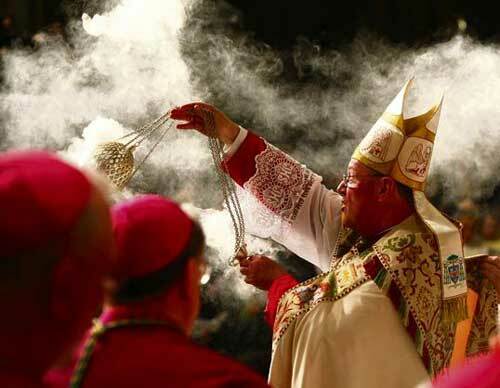 Archbishop Timothy Dolan, President of the US Conference of Catholic Bishops, spreading smoke at his day job. Basset points out that the Stupak Amendment, though it passed in the House, did not make it into the final bill, but its removal, which made possible the passage of health care reform, came at the price of President Obama’s promise to issue an executive order prohibiting federal funds from paying for abortions. This “failure” on the part of the bishops to get the letter of their demands has certainly not inhibited them from exercising their power over legislators, especially since the Republican takeover of the House this year. Republicans have introduced three bills whose passage, women’s groups are arguing, would have a chilling effect on women’s reproductive freedom: the Protect Life Act (H.R. 358), the Abortion Non-Discrimination Act (H.R. 361) and the Respect for Rights of Conscience Act (H.R. 1179). Basset points out that each of these pieces of legislation was authored in part by Richard Doerflinger, Deputy Director of the Secretariat for Pro-Life Activities for the Conference of Catholic Bishops, and all are the subject of intensive lobbying by the bishop’s Ad Hoc Committee on Religious Liberty. Besides being a spooky story about a governmental attack on personal freedom at the behest of a small group of powerful men, Basset’s piece highlights one of the great weaknesses of American representative democracy: it is extremely vulnerable to being manipulated to thwart the people’s will. Naked money, though it is clearly one of the very greatest threats, is not the only source of danger. The bishops are not as capable of outright buying influence as, say, Wall Street bankers or corporate chairmen, certainly. Oddly enough, they’re not even capable of speaking for the majority of their own constituency with any accuracy. Basset notes that a majority of Catholic men and women (about 22% of the US population are nominally Catholic ) favors the use of birth control; 63% support mandating insurance companies to pay for contraceptives. So why does this group of bishops have so much power over federal lawmakers, and what does it mean about us as a nation that they have such disproportionate power to their size and relevance to the people’s interests? The first part of that question is steeped in complicated history and, therefore, defies any easy answer. Obviously, the Catholic church is a powerful institution in the Western world, and though, like all organized religions, it’s shedding believers (not to say devotees) in developed nations (not least of all through some scandalous faults of its own), it hangs onto its privileged social position mainly by virtue of very deep pockets and deep, deep roots in the cultural soil. But why are American legislators so vulnerable to the bishops’ sway? Don’t we have strict separation of church and state here? An innocent might say that the key lies in the moral strength of the bishops’ positions, that American legislators are susceptible to them because, fundamentally, the US is a conservative nation that accepts the authority of religious institutions in matters of conscience. An innocent might say that, but it doesn’t explain why our political class is more apt to restrict women’s freedom of reproductive choice than even self-identified Catholics in the general population would if they had direct power over the democracy. President of Catholics for Choice Jon O’Brien, however, believes the establishment of the ad hoc committee was more about money and political power than religious liberty. If the bishops win on these pieces of legislation, chalk it up as a loss for American women–and American democracy. This entry was posted in Democracy, Politics, Religion and Irreligion and tagged Catholic Church, First Amendment, health care, religious freedom, reproductive rights, US Conference of Catholic Bishops. Bookmark the permalink.